US, 1973, 90 minutes, Colour. Cliff Robertson, Pamela Franklin, Eric Shea, Rosemary Murphy, Bernadette Peters, Alice Ghostly. A likable enough film, not great at all. Eli and son Rodger are would-be aces of the sky, 1920s style, enthralling the backblocks of the U.S. Period re-creation is nicely detailed and aerial sequences well done satisfying nostalgia and excitement. Story is the old moralising one (a little franker these days) of the footloose father and the worldly wise childlike son well enough portrayed too by Cliff Robertson and Eric Shea. This is always a difficulty for viewers: the film looks at times like a children's film, but the theme and treatment are adult. Pamela Franklin appears as a deceptively charming and disillusioning gold-digger. Probably an effective drive-in supporting feature. 1. How entertaining a film? Its re-creation of a period? Its focus on aerial work and stunt work? Human relationships? The interrelation of the aerial work and the human themes? 2. The film was shelved for a long time, re-worked. Is this evident? Why the hesitation of the studios to release the film? Could it have been improved? 3. Colour photography, the atmosphere of the '20s, music? Location photography and authenticity? The special effects especially with the flying, the crash? 4. Audience response to the humanity of the plot? The focus on Eli as a person? As a husband, father? His inability to readjust and the way this was illustrated? The bond with Rodger? Taking to the road, the series of adventures, his work in the planes and what this meant to him? The bond with his son in the plane? The significance of the title as summing up character and the relationship? The encounter with Shelby and her effect on him? The background of Hannah, Alison and Sister and their contribution to his life? 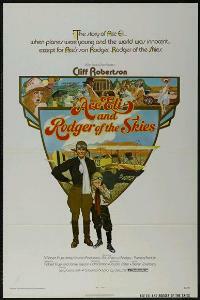 The focus of the film on Rodger, as a credible young boy, the son of his father, affected by the adventures, the people met? Family, friends, Shelby? 5. How well delineated were the characters? Eli as a credible person in this situation, Rodger as a credible young boy? 6. The character of Shelby, her background, her presence, her effect on Eli and his emotions, the repercussions on Rodger? The revelation of the truth about her? 7. The homely portrait of Hannah and her contribution? Alison, Sister? 8. Comment on the emotional crises and the way that they were handled. Good judgments, bad judgments? 9. The impact of the aerial work, the danger for Eli, for Rodger? Thrills, excitement, abilities and talents? The risk of danger and death? 10. How well portrayed were themes of relationships, hopes and ambitions, fulfilment in life, disappointment and disillusionment? How entertaining a film, how wise?